It has been a long, long time since I did a blog hop. I saw my friend, Holly, participated this one today so I decided I'd do it, too. So what's fab in my life right now? 1. We have our new floors in. I am beyond excited about this and they are beyond fabulous. No more nasty carpet, woohoo! They look amazing (there will be a post about this soon!). 2. 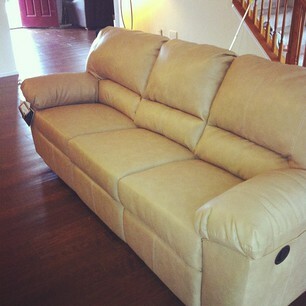 It is also fabulous that our new furniture came in yesterday. 3. This week was Kanin's Fall Party and the kids in his class thought these little monsters were pretty fabulous. You gotta love Pinterest! 4. It is fabulous that Caleb has sat on the potty a couple of times this week. Now, if he'd only take his diaper off to do it. LOL Baby steps, people. This is a huge improvement over running away screaming. 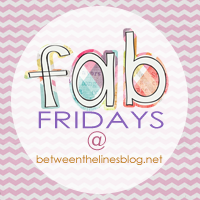 If you've had a fabulous week, head over to Between the Lines and tell everyone about it. 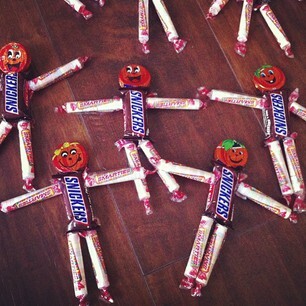 How cute are those little halloween candies. Visiting from Laura's Blog (Between The Lines). Hooray for new floors and new furniture. 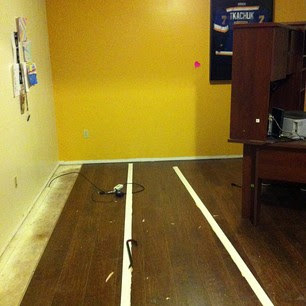 We have laminate flooring downstairs, and we are working on putting it in our bedrooms. I'm not always a big fan of the look of it, especially in bedrooms, but we had nasty carpet upstairs, and we're trying to sell our house...so, $900 for new carpet wasn't happening...and really, we love it upstairs. (whew, that was a huge, run-on sentence) Yours looks great. We have a lighter color, but in a future home, I'd love the darker. Hi! I'm visiting from Laura's blog (Between the Lines). Love your new couch and those little Smarties monsters are too cute! I somehow missed those on Pinterest.